Quilting Adventures: Is there anybody out there..........? On the quilting front, I have been extremely busy. I do want to apologize for the deficiency of posts. It's really not for lack of projects to blog about, but more about taking the time to write. Last year I participated in 2 (two) gift exchanges, one of which was the annual SSCS organized by Donna of Chookyblue. I've been participating in that swap since I first started blogging and have always been pleased with my Secret Santas. This year is no different! My Secret Santa was Bec, an Australian, from Oh Sew Busy blog! As you can see, she made me this beautiful lap quilt that already has a place in my living room. I just love the fabrics she used. 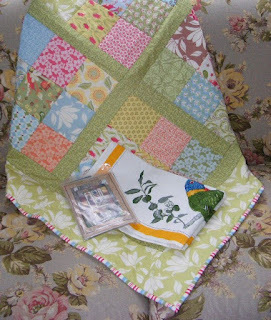 She also included a quilting kit and a tea towel made in Australia. There was also a cute wool ornament, but it has been put away before I had a chance to take a picture. This year, DH took the tree down way too early for my taste. sigh! Thankfully, you can see it on Bec's blog as she did post a picture! Thank you again Bec, the quilt is gorgeous! The other swap is from a primitive group I belong too. This is my second year swapping with that group. My Secret Santa was Debborah from Woollen Sails. This is what Debbie made for me! Aren't they sweet! She has that "prim look" so well done! 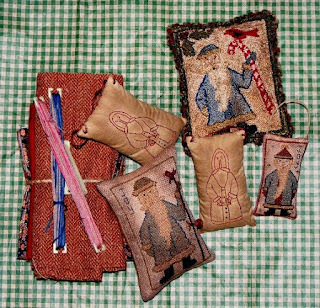 One of the ornaments is an original pattern that she has offered as a freebie on her blog. You may check it out here! I you can see, I have just been spoiled again! Thank you again Bec and Debbie for the lovely gifts! As for a New Year's resolution, I will resolve to post more often! I love blogging and I have made such wonderful friends! There is no excuse for the neglect! Gorgeous gifts! I know Bec and she is a real sweetie...what a beautiful quilt she made! I hope 2011 is all you want it to be! What wonderful gifts!!! I love the colors in your lap quilt. You did a good job with 20 of your 26 projects completed. I wish I could say the same. 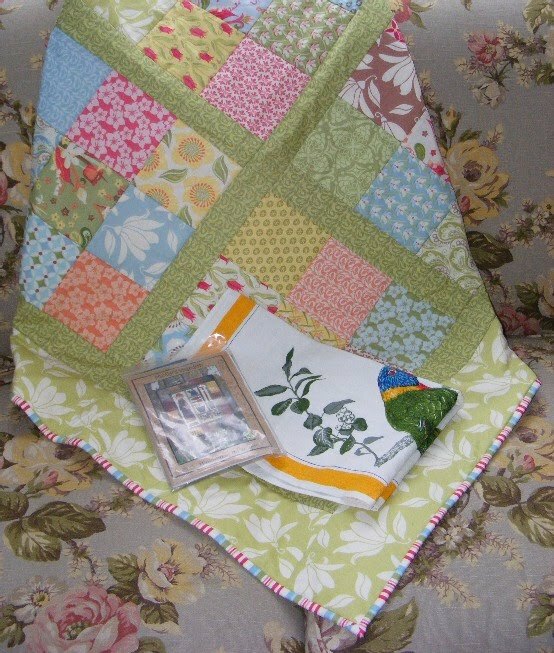 I was your swap partner last year Carole and the mini quilt that you gifted me with is amongst my favorite quilts. It sits in my studio as a table topper but when we've finished some of the renos to our new/old house, it will take up residence in our den/family room. Thank you again for my little treasure. The gifts that you received this year are lovely. And yes, please post more!!! Looks like you had some wonderful swaps. I can't believe you had 20 out of 26 projects -- that's fantastic! Congratulations! Pink Floyd . . . . now that's not a topic you find every day on a quilter's blog *lol* Hubby is a big fan - so I listen along. Getting ready for a BIG storm (fingers crossed) Lots of stitchin' to work on. Hope you are having a wonderful new year! The Wall is a classic! You sure have been busy last year, finishing 20 of 26 projects, well done.